We On The Fourth Floor understand that not all bags can transition through the seasons. Our bulky black leather purse we’ve been toting around for eight months, while gorgeous, can be a bit heavy and dark when temperatures start to soar. 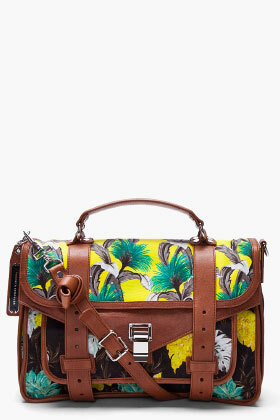 First up is the always-popular PS1 satchel by Proenza Schouler ($1488), but in a great tropical print. As we’re sure you’ve seen a certain ubiquitous neon satchel, nothing says summer like a fun, bright bag. It may be a bit pricey, but FASHION shows us how to rationalize this investment piece. (Both Natalie & Christina are big fans). 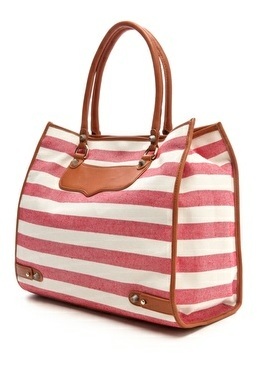 Erin is in the mindset for summer and says “all I need is my bright pink rattan beach bag for my towel, sunscreen and a good magazine,” which makes this Rebecca Minkoff tote ($206) perfect for a jaunt to the beach. The newest member to our Fourth Floor crew Christie, is a self-proclaimed “loyal Coco-follower and heavy advocate of the double C’s. 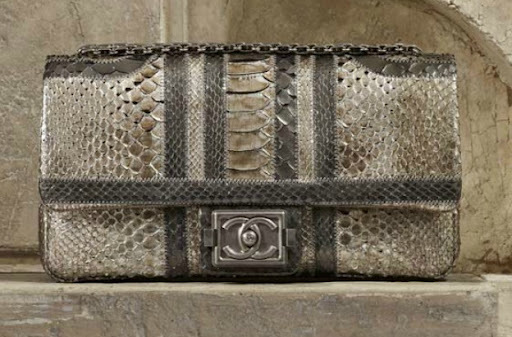 Often the 2.55 is A. overdone and B. not always summer friendly,” but would opt for this Chanel metallic python version if money was no object. Price point? Not in our budgets. 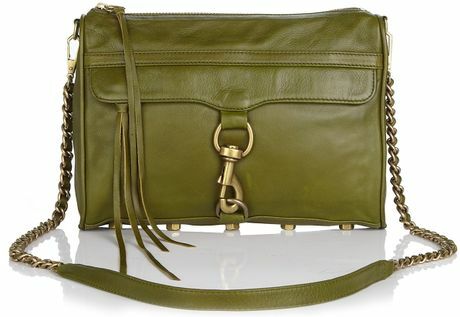 If money was no object, which bag would have your eye on? It’s HOT outside (obviously). On the Fourth Floor, we’re always looking for ways to cool down that also include tasty beverages (preferably to be enjoyed outside). 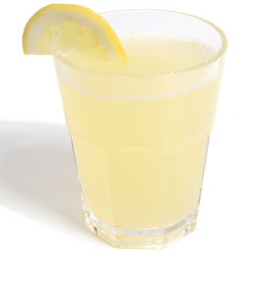 Enter Lazy Days Lemonade, which is a perfect summer cocktail made from a refreshing combo of white wine, vodka and lemonade. This light drink is great to sip pool side, on a dock or even just on your apartment front porch. Mix all together in a large jug or punchbowl. Garnish with a slice of lemon and add ice to each glass before serving. This recipe works best in a large juice jug for multiple servings and multiple friends. 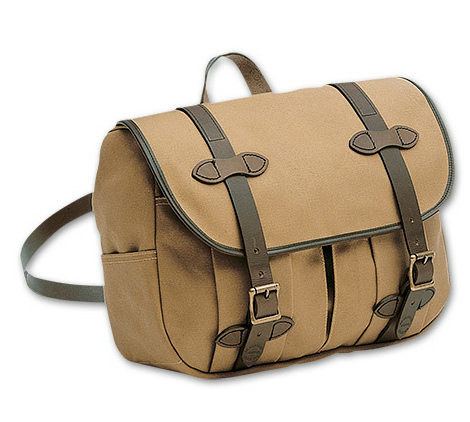 We love this one from Crate and Barrel for $49.95. What’s your favourite summer cocktail? Tweet us @rockitpromo. There’s nothing quite like summer to make us nostalgic about our childhood. Two months of blissful, school-free days filled with swimming, ice cream and road trips. The heat must be getting to us On The Fourth Floor, because the other day we started reminiscing about our favourite memories of past summer vacations. 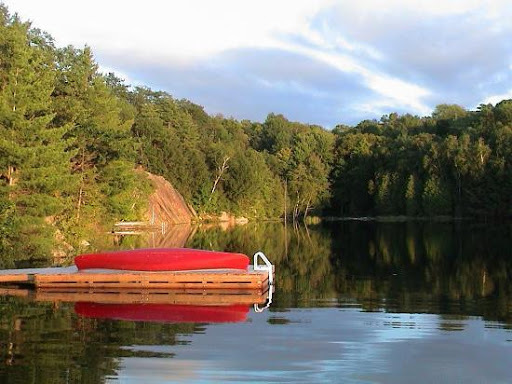 My grandparents used to live on a lake near Parry Sound – it’s my favourite place in the world. We’d be outside all day and in my case, most of the time was spent in the water. At night we’d hang around the fire and play horseshoes. I have such great memories of being up there. Lots of laughter, jokes and love. Just picture a mini-Lisa jumping off that dock. I spent every summer from ages nine to 19 at Camp Winnebagoe. Life was good. I made lifelong friends, spent every waking moment outside and learned so much. 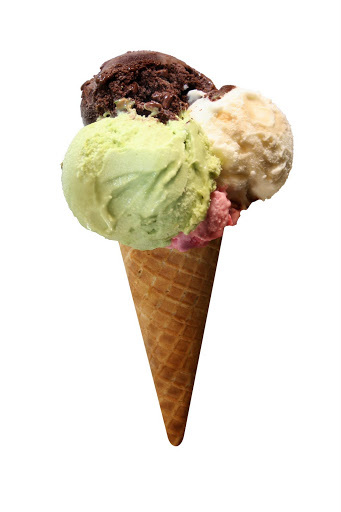 I love Murphy’s Ice Cream Parlour in Streetsville. My grandpa used to take me when I was about five, and it was always the happening spot in the summer. All the cute soccer playing boys would hang out there, which was nice little eye candy to go along with the ice cream. I still get a kiddy scoop of Caribou Tracks when I go there now. My family always takes an annual summer trip to Stowe, Vermont. It’s the annual Stark Stowe reunion. We make T-shirts every year. We usually stay at the Golden Eagle resort and hit the bike path, alpine slides, Ben and Jerry’s factory, and a dinner at The Whip. These trips have become especially fun and meaningful since both my brother and I have had kids. I loved going to the Toronto Zoo. I always had a fascination with watching animals and thought of it as such an adventure. I still dream of going to African Lion Safari – maybe this is the summer! 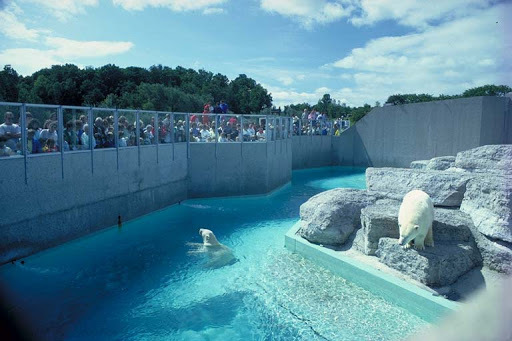 The mighty polar bears at the Toronto Zoo. I grew up spending summers in Bass River, Nova Scotia. As a city girl, I adapted quickly to country living (with a ton of allergy pills and nose spray) and soon learned to milk a cow, drive a tractor and race around on a four wheeler. My favourite memory is when we spent two weeks camping across Newfoundland with our best family friends. I think it’s one of the most beautiful places I’ve ever been. I loved the cottage that my family used to rent just north of Sudbury. My brother, sister and I would basically be left on our own for the entire time, and we loved it. We’d swim, fish, explore in the woods, read books (well, only I would do that), stay up late and roast marshmallows over campfires at night. I still love going to cottages, and try to get to a friend’s every chance I get. To me, it’s the essence of summer in Canada. I also spent my summers up at camp in Perth, Ontario. It is where I found my independence, hit puberty and fell in love. I also learned how to build a fire, camp out with just a tarp and play capture the flag. I love the memories that I have and wouldn’t trade those summers for anything. What is your favourite summer memory? Leave a comment, or tweet us @rockitpromo. Last week, two ladies from the fourth floor got a chance to check out some live music at XM Radio’s Verge Music Awards. They won all-access passes to see fourth floor faves Tokyo Police Club and Gord Downie perform at The Mod Club (thanks, beat scene!). The night was great – busy, good music and lots of buzz about the awards (all of which came with a nice cash prize.). Zeus, formerly Jason Collett’s back-up band, took home the coveted Album of the Year, beating out bands like Arcade Fire, Stars, Broken Social Scene and Hot Hot Heat. 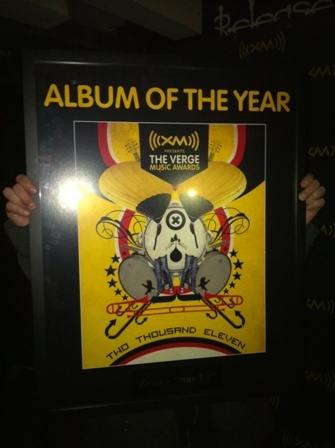 Tour manager Jeremy proudly holding the “Album Of The Year” award. The band was thrilled with their win, and Neil Quin and Mike O’Brien were more than happy to chat with us about their upcoming plans. They’re taking part in Canadian Music Week, playing tomorrow night at The Horsehoe Tavern at 12:20 a.m. They played to a packed house last year, so this show is sure to be just as busy, especially with their latest coup. Next, they’ll release their double-sided single Permanant Scar/The Darkness in April on Arts and Crafts. Permanant Scar is a “harmony-laden rock and roll” track, while The Darkness is described as “a thoughtful and moody track”. Can’t wait to hear it, and the new album they’re recording this October. 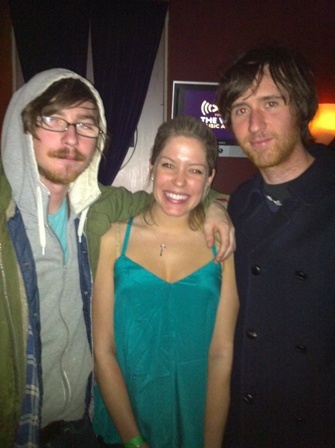 Neil, Christina and Mike grinning from ear-to-ear after the win is announced (well, at least Christina is). We spent the rest of the evening just chatting with them about life in general, including a serious discussion about brunch in Toronto. We were fans before, but are bigger fans now after getting to know them a bit. Here’s hoping that they continue to be recognized for their great music. Stream Zeus live here, from CBC Radio 3, and find out for yourself what all the hype is about. You won’t be disappointed. You’ve met our whole team over the past few months and now we have a challenge for you. 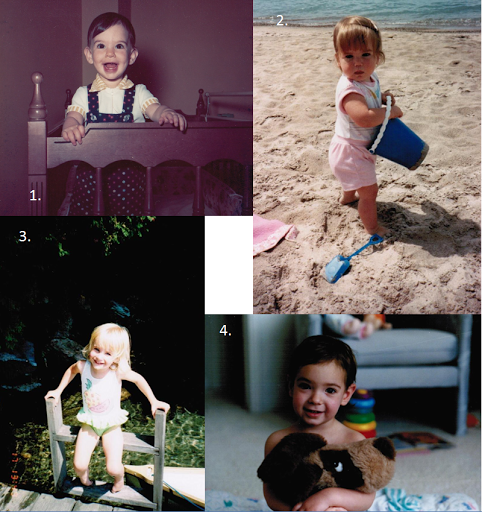 We’ve dug through the photo archives (back when photos were printed on paper, not stored on computers), and pulled out shots of ourselves when we were in diapers. 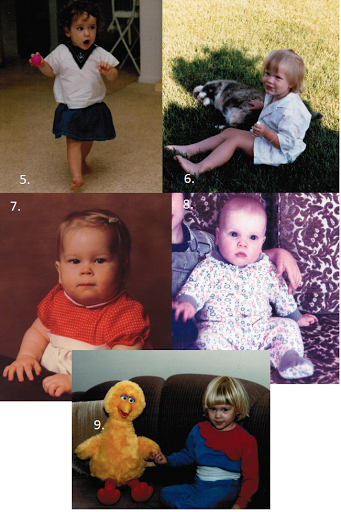 Your challenge: Guess which chubby face belongs to which gal on the fourth floor. You’ll win tickets for two to an upcoming Canadian Stage production. carly.intern [at] rockitpromo [dot] com. This first correct guess wins. Go! It’s Valentine’s Day – got plans? Whether you’re single, in a relationship, or “it’s complicated”, the pressure’s on to do something today. Fear not – if you haven’t yet figured out your game plan, we have some non-cheesy ideas to help you out. The great thing about being single for V-Day is that you don’t have to consider anyone else when making plans. Pretty sweet. If staying in, grab some wine, takeout and a classic romance like The Way We Were or Breakfast at Tiffany’s. These flicks focus on good storytelling and great acting, so you won’t roll your eyes at the love stories. Lisa: My best Valentine’s Day ever was at my friend Fran’s house. We were both single, so she invited me over, cooked her famous KD, with dill pickle-flavoured Crispers and tortilla chips with spinach dip. We dimmed the lights, lit some candles, and laughed more than I ever have before on Valentine’s Day. Take the pressure off to do something romantic and hang out with friends. The Drake Hotel’s 86’D Monday, Valentine’s Edition, is a great night out. Bartenders will compete for the honour of best Pink Squirrel. What’s a Pink Squirrel, you ask? Find out tonight at 7 p.m. There’s also great live music from Boot Knives to go along with your cocktails. This is not the Pink Squirrel that will be at The Drake. Michelle: Being single on Valentine’s Day can be super fun. I’ll have dinner with my other single friends at Woodlot and dance up a storm at The Modern Love Affair party at Footwork. Valentine’s Day doesn’t just have to be about romantic love. Of course, being in a relationship for Valentine’s Day is great. On what other day of the year is it acceptable to publicly proclaim your affections in the most over-the-top way you can think of? Instead of typical roses and chocolates, why not show your love by making something yourself? The effort put in will be majorly appreciated. 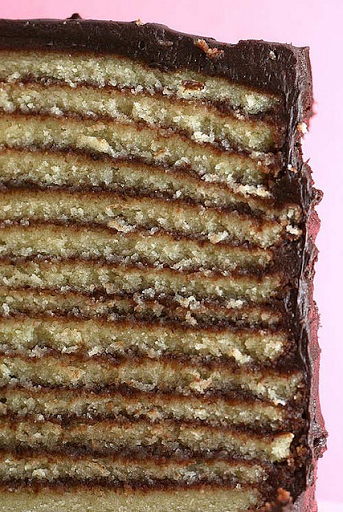 We love Bakerella’s massive list of sweet treat suggestions. Like her 14-layer cake. Rachelle: Valentine’s Day will always hold a special place in my heart. I got engaged on V-Day in Quebec City during Winter Carnival. My husband Ariel proposed in front of 80,000 onlookers at the annual Winter Carnival parade. We became local celebs, made it into two newspapers and were the photo of the day on Le Soleil’s website. Just because you’re taken doesn’t mean you have to have a quiet, candlelit dinner. Go for a skate on an outdoor rink with some hot chocolate, then play a board game at Snakes and Lattes. Some friendly competition, a wobbly pop and a few good laughs is a lovely way to spend an evening. Christina: Favourite spot? My house! I hate going out to restos because more tables are crammed into the same space. This year, the fiancé and I are grabbing some lobsters, a bottle of wine, and watching America’s Funniest Home Videos. Wow… I just realized how domestic that sounded. Another fun idea is a staycation. Find a deal on Hotwire.com, or get a package from a hotel like The Drake or the Yorkville InterContinental. It’s a getaway without the hassle of travel, and you won’t even have to make the bed in the morning. Debra: For one of my fave Valentine’s Days, Matt had our friend Chef Ezra Title drop off a delicious meal at our house. Matt’s a fantastic cook, but this was nice as he didn’t have to do anything but follow some simple instructions, and we had a brilliant meal at home with nowhere to go after but our living room to listen to music and drink wine. Christina talks about her experience with our client Reebok’s latest fitness apparel line, EasyTone. Background: The idea behind the line is that the clothes inspire women to move with intention. 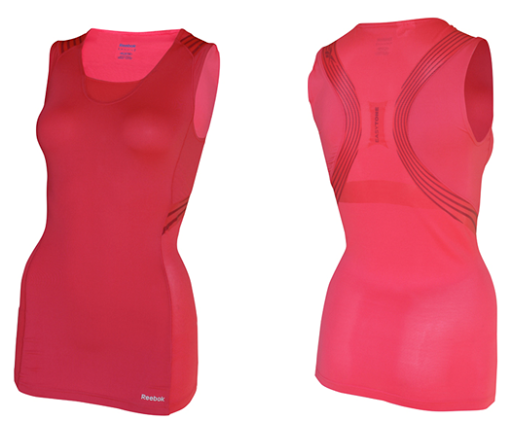 The ResisTone resistance bands in the tops are designed to improve posture and correct alignment during activity. The resistance bands in the bottoms are designed to tone and strengthen muscles while you move. To help me stick to my New Year’s resolution, I was given the opportunity to test out the recently launched EasyTone apparel from Reebok. Armed with Reebok’s black EasyTone capris and black EasyTone sleeveless shirt, I decided to put these clothes through the ringer. Over three weeks, I wore it to the weight room, spin class and the kickboxing studio. Reebok gear helped Christina pull this move off (almost). My initial impression of the gear (before attempting to workout) was that it looked pretty cute, and I was excited to sport the outfit in public. The cut of the capris is very flattering and the top is the perfect length, hitting at the hip bone, just where I like my shirt to end. The fit was a little tighter than the usual workout gear, but after a few minutes of strutting around the house, I felt my inner fitness diva coming out. After my first few workouts, I noticed I like these clothes better than other fitness clothing I’ve worn, hands down. The built-in resistance bands in the shirt made me stand up straighter (or while I was spinning, sit up straighter). I’m a bit of a sloucher, so anything that can improve this is a definite bonus! The resistance bands in the pants are invisible, which, in my opinion, made them more comfortable. 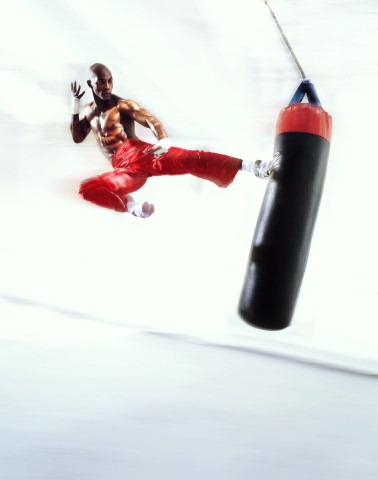 I could feel them making my legs work twice as hard, and felt like they were toning even more intensely. Added bonus: the bottoms are made from thicker material than most other gear, causing any bumps or lumps (everyone has them!) to be flattened and smoothed out. I also noticed that sweat evaporated off the material very quickly. Amazing. I recommend the EasyTone gear to anyone that wants a workout with added benefits, like improved posture or a toned derrière. Plus, the fact that they’re stylish helps when you’re hitting the gym, track, trail or even shopping for groceries! EasyTone apparel is available at select Sport Chek locations across Canada. 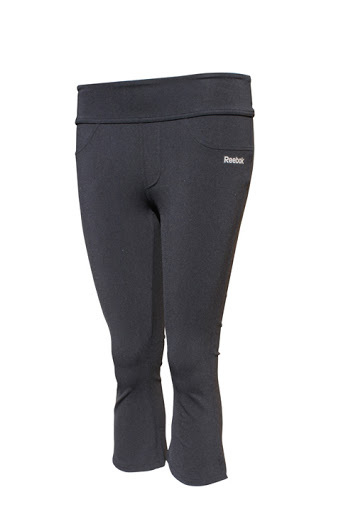 EasyTone bottoms include pants ($79.99), capri pants ($69.99) and shorts ($54.99, coming in April).